Join the discussion on our forums! Come discuss Hobart Grapplehammer over in our dedicated Hobart Grapplehammer discussion topic. OK, I love this card. His sounds and effects are perfect in cancer warrior. Ok I love this card. His sounds are amazing and he is OP in my face warrior. I swear to god, but since MSG release I never saw this card be used. Not even once. Works great in my wild control warrior with 2X FWA, 2X Death's Bite and one Gorehowl. Pulled a golden one today from my arena pack. I have to say, this is the most underwhelming golden animation I've seen. But I do like the mechanical squirrel. If he added +1 durability along with his +1 weapon damage, he'd be impressive. Get a face Gorehowl hit in your deck. Opened this guy. Played a few games. I have to say that my main problem with this card is that it's tough to find a balance in how many weapons you should run. Too many and you wont have enough resources otherwise such as minions, and too few and the buffs aren't worth it. All in all still pretty fun to use and of course the animation is really cool! Four. The answer is four. They should have done something with that mecha squirrel in the golden animation. 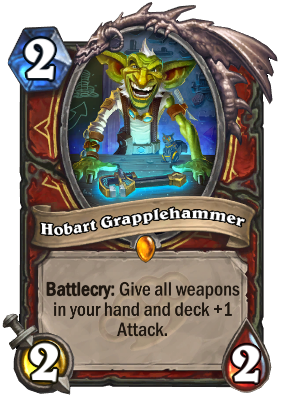 Am i the only one who thinks its weird that Hobart, a warrior legendary, has a rogue weapon on the table in front of him (cogmasters wrench)? Great for slower warriors with gorehowl and fools bane, but seems too slow for aggro pirate warrior. This effect is STRONG if you excpect to get in alot of "real" weapon hits. But in an aggro deck you will only get a few hits, as many of your weapons actually are battlecries and spells (N'zoths first mate and upgrade). I'm not the only one who thinks this card is broken in Pirate Warrior am I?